07785 373 960 or email. Working alongside our clients, The BIG BLOCK Company collaborates on what we want the project to achieve. Continued easy communication between project managers/site managers and our team means the project can be achieved in an open manner without unnecessary complication. Here at The BIG BLOCK Company we produce the best quality and secure workmanship in creating retaining walls for their clients. The BIG BLOCK Company prides itself on being professional and approachable, and this is what makes us stand out. Using our concrete blocks we can create any retaining wall that meets your requirements. Our Storage and Containment developments are reliable and long lasting, whether it is for a farm, industrial ground, business, or personal project, you will find our work fits in seamlessly with the unmistakable signature of high quality finish and reputable clean workmanship. The BIG BLOCK Company has the ability to create custom interlocking blocks for their clients’ needs to make sure that we give the customer exactly what they want. When dealing with our clients we have a very good reputation for our high quality work and our attention to craftsmanship and professionalism. 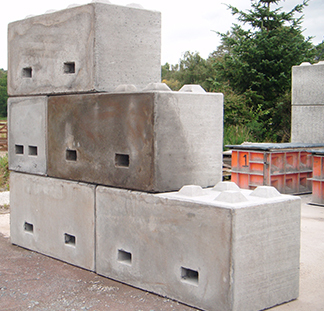 Welcome to The Big Block Company, Scotland’s leading manufacturer for concrete blocks. We are leading the way in Scotland for manufacturing low cost, reusable interlocking concrete blocks for a wide range of industries. We have an ever growing range blocks of concrete. Check out our product range and there you will also see the custom interlocking concrete blocks we can produce. © The Big Block Co Ltd. All rights reserved.